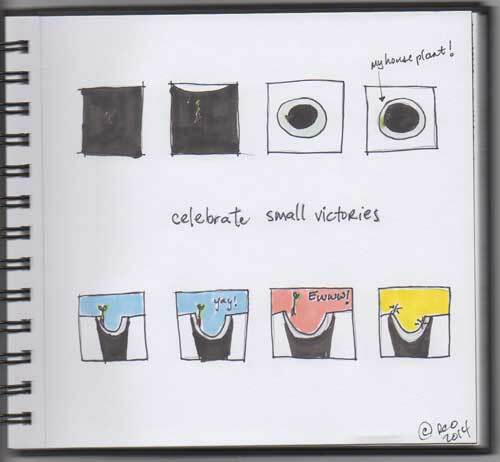 …celebrate small victories (even if they may not actually seem like victories). ***I grew a small plant! A seedling actually. But still, a small plant! And I grew it! All. On. My. Own! This is a big deal – I have struggled to grow plants and to keep them alive. And this plant even lived for a few days. Until I decided that growing a small plant out of the side of the sink I never remember to clean was probably not something to celebrate. But instead something to be mildly disgusted by. Moving forward I plan to celebrate small victories – like wiping down the side sink on a regular basis and maybe even growing another house plant (in a pot with soil). A couple nights ago I was reading a blog post and I really liked it. I liked it so much I decided to write a comment. And that comment required me to log in to my own blog account. Huh. I have a blog?!?! I didn’t exactly forget I had a blog. I just neglected to remember for the past few months. Huh. How could you forget your own blog, you might be asking? Well, life just gets busy. And then it finally gets a little less busy and I find myself reading other people’s blogs. And then something reminds me – “hey, you have a blog too.” And it is neglected and lonely and would love for someone to pay it a little attention. Huh. So here we are today! 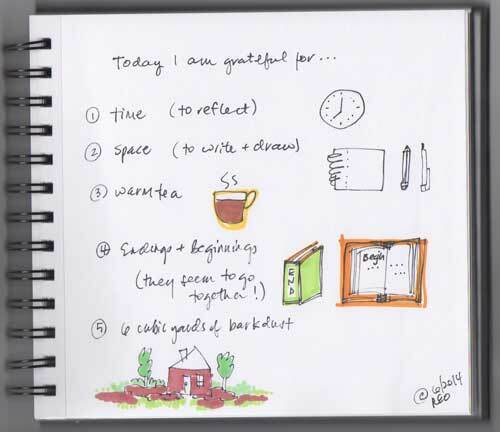 And today, if I were my own best friend I would remind myself to be grateful! Because honestly, after waking up at 5am with a cranky 2 year old who battled for every single decision of the morning, socks, shoes, toast, milk, to wear clothes or not, to stand up or not, to go completely spineless and boneless (how do they do that?!?!) when I pick him up…. well, suffice to say I was not feeling very grateful. But that is the beauty of trying to be my own best friend, right? Space – at this moment I have the time and space to write and draw and that is a beautiful gift! 6 cubic yards of barkdust – Seems kind of random right?!?! But there is something rejuvenating about the physical labor of spreading 6 yards of bark around your home and feeling sore muscles three days later to remind you of it. So, serenity now. Time, space, warm tea, endings & beginnings, and bark. I wish you all a happy and grateful type of day. And I hope you all make it out of the house wearing more than a diaper, two socks, and a shoe.